When you and physics disagree, physics wins. Biologically inspired design (BID) can provide tremendous innovation in product design and development, but not every instance of bio-inspiration is destined for success. Even when the biology appears to align closely with a design challenge, it may not yield an effective solution. It all comes down to the math. Without at least a basic quantitative analysis to ensure feasibility, bio-inspired design is just bio-inspired dreaming – worse yet, frivolous development may lead to bio-inspired debt. Consider this example: trees can grow very tall. In fact, giant redwoods can tower over 100 m. Still, they manage to transport water from their roots to their leaves without any massive turbine-based pump. They rely on a combination of capillary pressure and evapotranspiration to do the work for them. Genius! Why don’t we use this to get water to the rooms of hotels and high-rises? We’ve just saved a bunch of energy! But is it really that simple? PL is the Laplace pressure, V is the droplet volume, and r is the radius of curvature of the surface. 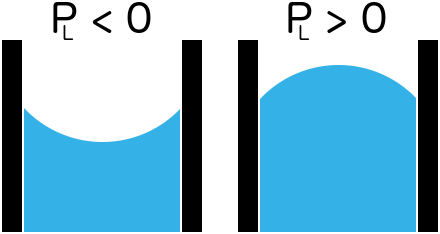 The pressure is, by convention, positive when the water surface is convex relative to the air (droplet) and negative when the surface is concave relative to air (bubble), as indicated in Figure 1. Figure 1. Depiction of Laplace pressure orientation. For a derivation, check out this Wikipedia article. In the ideal case, we are removing water from the end of the tube quickly enough to achieve the above flow rate. If not, the water pressure will balance out at the end of the tube and the flow will stop. To simplify, let us assume the tube length and height are effectively equivalent (completely vertical). The opposing radial terms (r3tube and -r4tube ) indicate that the flow rate can be maximized for any given height. Now comes the fun part: what are some reasonable parameters to throw at this equation? This is over 4000 square feet – a nicely sized home – and does not even account for the thickness of the tube walls. Trees must do better than this. What are we missing? The previous calculations presumed a set of parallel tubes with constant radius. I know I never provided an alternative, but did you stop to consider that there might be? In fact, had we considered tree biology more carefully, we might have expected our lackluster result. The channels in trees actually branch and get narrower as they stretch from roots to canopy. This is a learning moment: a superficial understanding of a biological system can lead to significant design oversights. Note that the final resistance is over the entire cross-section of the number of tubes; hence, it appears in the equation (ntube). This is the minimal flow resistance we can achieve with a constant cross-section, while permitting fluid transport along the entire length of the tube system. This implies that flow is maximized when the end tube radius, rL+lΔ, is 0. This is unphysical, but tells us that we want to make the final radius as small as possible, while still allowing the fluid to flow according to the equations we are applying. Water molecules have a diameter of about 0.275 nm. Let’s say we want the tube to be at least 100 water molecules thick; this means a minimum radius of 50 water diameters or about 13.8 nm. What does this mean for f? That is definitely small; more than twice that fraction of people get struck by lightning each year in the U.S. This is actually on the order of what one finds online for the water uptake of redwoods. Trees have constraints that we don’t have to worry about, so one might expect our idealized results to far surpass their uptake. However, redwoods are not beholden to idealized mathematical constructions. The xylem may achieve effective pore diameters below our chosen target; the Hagen-Poiseuille equation may not even apply under the conditions near the xylem terminus, possibly providing for a higher flow rate. Also, the fluid in the xylem can be doped with salts, polysaccharides, and proteins to achieve higher surface tensions (although this will likely increase viscosity, as well). Finally, redwoods can use other tricks to generate flow, like osmotic gradients — but we’ll leave that discussion for another day. Unfortunately, matching the redwood isn’t good enough for us. We would need at least one redwood-sized volume for every 6 people, which amounts to a small forest for even a single 32-floor high-rise. This is a small room’s worth of area on each floor. Takeaway: the mechanism could be employed, but it imposes rather stringent constraints and provides little practical value. For the most reasonable application investigated (a 3-story home) there is no notable advantage over the water pressure already provided by the municipality. Moreover, we have yet to determine how to get water out of the structure fast enough to maximize flow. Trees can actually offer more insight there, but we’d have employ a different set of principles from those currently being discussed. So, was this a wasted exercise? First, we’ve established a parameter space within which the design principles may be useful. We’ve also developed formulas to assist the evaluation of future applications as needed. While people love to point to biology and say “Problem solved!”, the math is needed to determine what that problem is. This is a critical aspect of proper BID. Superficial examination leads to misconception and false analogy. A few hours of math can save a lot of resources in development — you can’t beat physics.